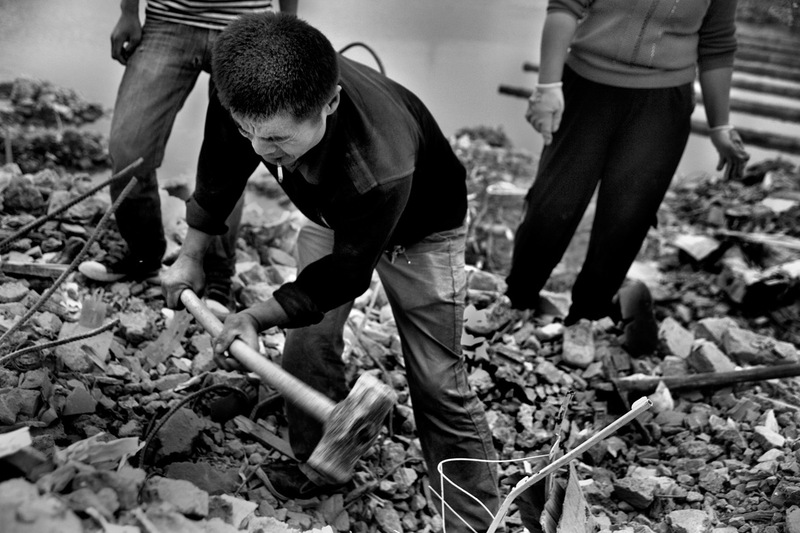 Workers break away bricks and concrete to find rebar and other metals for salvage in Nanjing, Jiangsu, China. 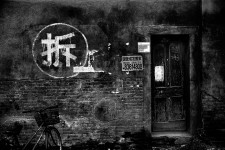 A mandarin Цhinese character spray-painted on the side of a building indicates the building will soon be demolished in Tianjin, China. Workers break away bricks and concrete to find rebar and other metals for salvage in Nanjing, Jiangsu, China.Workers demolish residential buildings in a small suburban village east of Nanjing, Jiangsu Province, China. 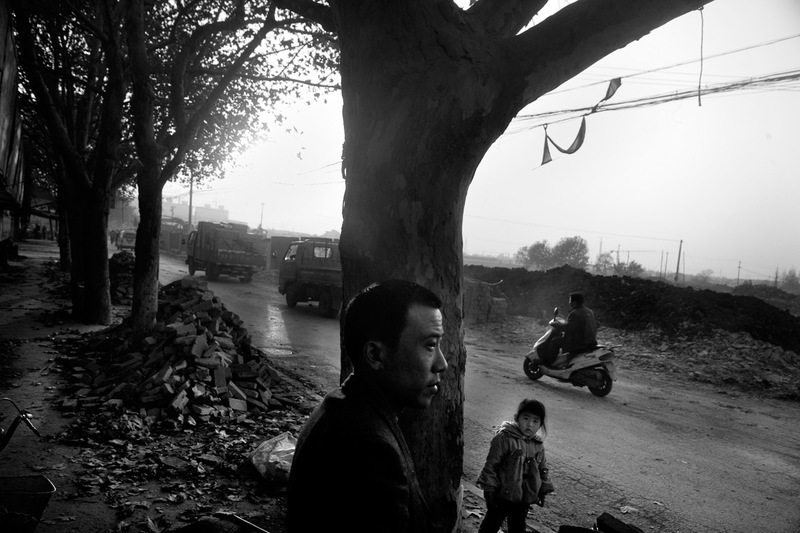 A man looks out onto a previously demolished area that will be developed into high-rise apartment buildings in Nanjing, Jiangsu, China. 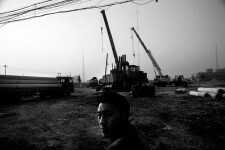 Though the old buildings aren't yet fully demolished, cranes have already moved in to begin the new construction. 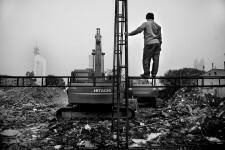 Welders look over a demolition site where hutongs, small residential alleys, once stood in the center of Tianjin, China. A local resident said that the relocated residents were compensated for their houses but it was "not enough." 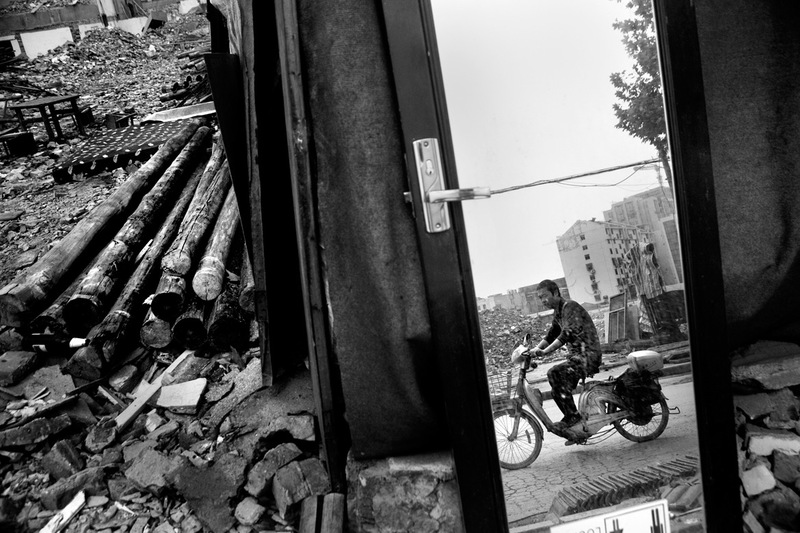 Salvaged home furnishings, including mirrors and doors, stand by the roadside for sale in a demolition area where houses once stood in Nanjing, Jiangsu, China. 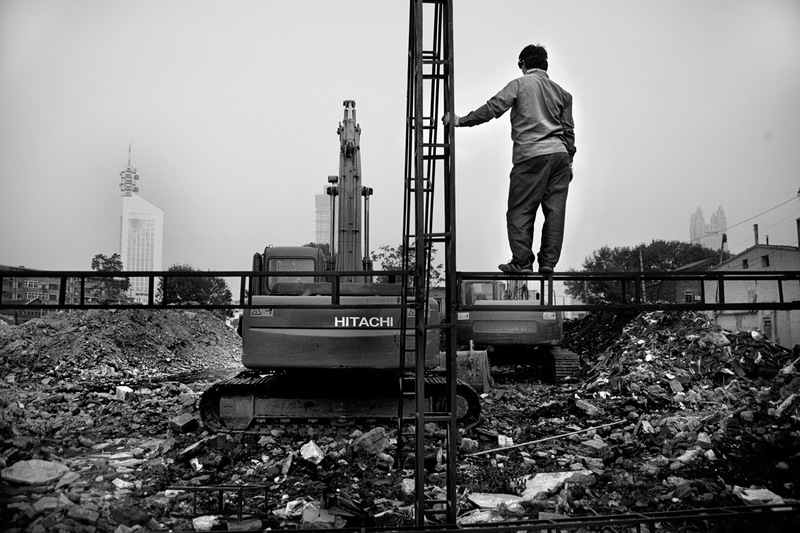 A man looks out over the demolition in what used to be a neighborhood in Nanjing, Jiangsu, China. 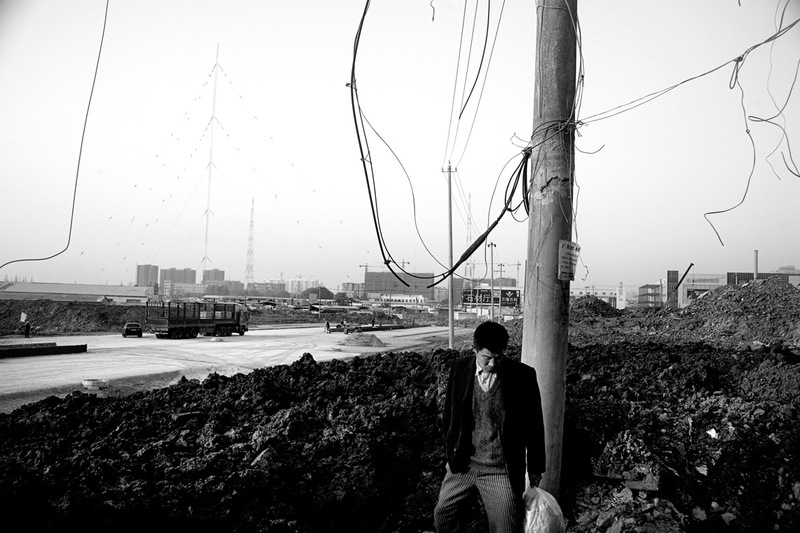 A man walks among rubble and downed wires as new construction begins in a partially demolished area of Nanjing, Jiangsu, China. 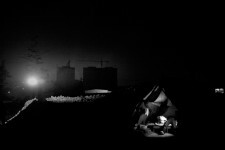 A girl watches television in a makeshift hut in the middle of a partially demolished area in Nanjing, Jiangsu, China. 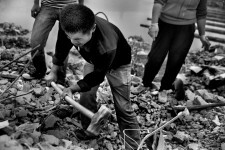 The girl's family finds salvageable material in demolition areas to resell. The converse of China’s rapid construction and development is a huge, patchwork demolition economy. In order to make room for the high-rises and hypermarkets, the country’s narrow residential alleyways (hutongs) and other fixtures of Old China need to be razed and repurposed. 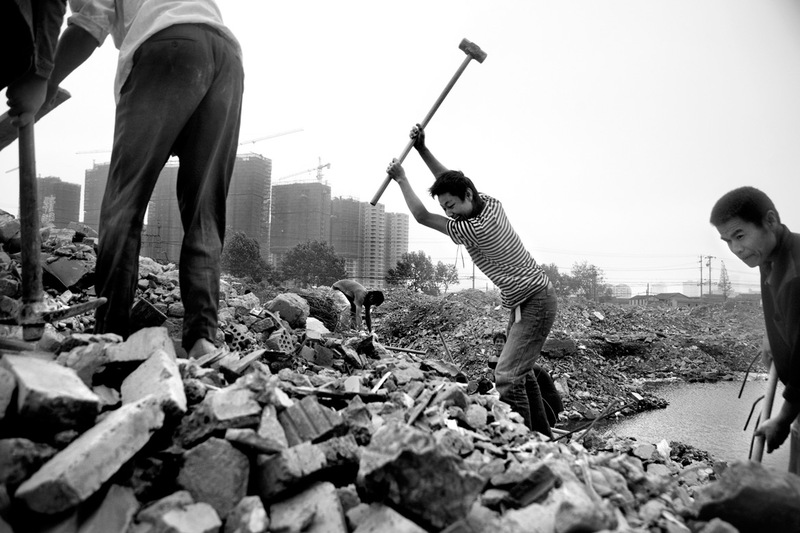 The old buildings are marked, and then come the heavy machines and scavengers with mallets and blowtorches. 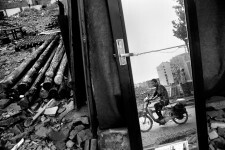 There’s value in the old buildings, from wooden doors to the rebar in their concrete walls and floors, and a small, movable economy sets up wherever there’s destruction to be done. The residents of these old houses are given money, but often it’s not enough. The only affordable housing to be found after a forced move like this is often well outside the city and far from any jobs or shops. 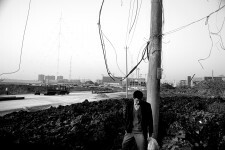 Their old houses may not have had running water or electricity, so the opportunity to move offers a step up the urban ladder in some respects. 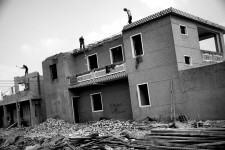 But as with any relocation, adjusting to a new neighborhood creates many headaches, especially if the money promised for the old houses never arrives. China’s economy continues to hum along, of course, and the demolition continues regardless of whether or not any of the new construction ventures will ever be completed.